A ready 900 sqft (SBU) 2 BHK apartment with 2 toilets, balcony, drawing, dining, kitchen on the 5th floor in a G+5 complex along with covered car park, lift, power back up and few amenities available for sale. property is well painted and lights fans are in place. 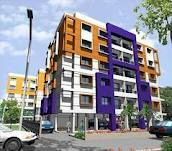 This project is located at EM Bypass Nayabad.